Shopping for real estate can be daunting. It takes time and discernment to know which house is right for you. 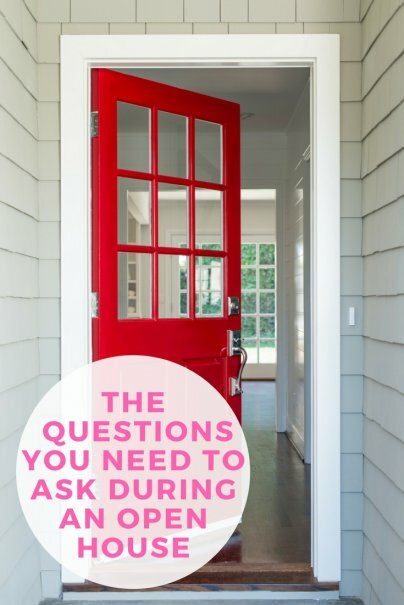 To avoid wasting time on open house visits, be prepared with these key questions. If you find a house that matches your wish list, chat with the listing agent to find out all the details you don't want to overlook. First things first: Pick up a copy of the property information. These are often on the kitchen counter or near the entry during open houses. Many people view the house, and then look over the information. But the disclosure statements often reveal things you'll want to see while on site; maybe there was water damage, or the carpets were recently replaced. Spend five minutes reviewing the property information so you can eyeball the improvements or issues as you move from room to room. Some listing agents will wait near the information sheets, ready to talk to prospective buyers. If you're not ready to chat yet, say so; the agent should accommodate your desire to view the house and review the information before either of you starts asking questions. Ask these questions to get an idea of the overall condition of the house and area. What's the reason for the sale? This may seem like a personal question, but it's a valid one. If the house is being sold because the owners are unhappy with its condition, need for repairs, the safety of the area, or the feel of the neighborhood, you want to know. Your goal is to understand if the reason for the sale is personal or due to an issue with the house or area. Don't press for personal information about the owners, of course; the agent should protect their confidentiality while giving you a top-level answer. If the agent is very hesitant, or unable to provide even a generic or partial answer, note that. If you're interested in the house, you can have your own real estate agent follow up with the listing agent. What are the biggest problems with the house? If you ask, "Are there any major problems with the house?" then the agent may say, "No, it's in great shape." Phrasing matters. Every house has problems. This is the time to find out what those problems are. The listing agent wants to sell the property, of course, but they want the sale to be a satisfactory one. Have there been any more water problems since the sump pump was replaced? How extensive was the termite damage listed on the disclosure? Have the owners done any further mold testing? Asking for more information will help you determine if the issues have been resolved or would require additional repair or maintenance. What are the average utility costs? Older houses tend to be less energy efficient, and can come with heftier utility bills than you'd expect. On the other hand, the owners may have a installed top-of-the-line HVAC system, put in double-paned windows, and invested in other energy-saving upgrades. The listing agent will know, or be able to find out, the average monthly cost for utilities. It's a good idea to ask for a typical monthly cost in the winter and in the summer, so you can compare how much the energy use might fluctuate seasonally. Has the price changed at all? The listing agent will know the history of the house, if the listing price has dropped or increased, and the reasons for any change in price. A lower listing price can be great news for you, but multiple drops in price should be a red flag. Was the house listed much too high for the area? Or are there major issues that are keeping buyers away? Have there been other offers on the house? Are the sellers eager to negotiate? Are the sellers in a hurry to sell? You may not get direct answers to all these questions, but they're still worth asking. If you are genuinely interested in the property, talking with the agent can give you insight on what matters most to the sellers. If they're in a hurry to move, for example, they might accept a lower offer with a rushed closing date. Is this a good neighborhood for families? Maybe you don't have a family; this is still a good question to ask, because "family-friendly" is often code for safe, clean, and welcoming. Are there community events nearby? Is there a neighborhood association? Ask the agent about the nearest places for shopping, entertainment, and dining out. If the nearest grocery store is 10 miles away but the nearest bar is just around the corner, it may not be so family-friendly, after all. Are there any parks or natural attractions nearby? What do people in this area like to do for fun? What's the best restaurant nearby? Do you know what the average income is for this area? Some questions are room-specific. Ask the agent to walk through the house with you and discuss as you go. Which appliances are included? How old are they? Have there been any major updates or renovations in the kitchen? Are there any water issues in the kitchen? Have there been any major repairs in the kitchen? Are there any water issues in the basement? Is there a sump pump installed? Have there been any issues with mold? How old is the carpet? Have the rooms been recently painted? Are the window treatments included? Have there been any renovations or updates done lately? Are there any water issues in the bathrooms? How recently have the bathroom fixtures been updated? Does the landscaping allow water to flow away from the house? Are there any wet or soggy areas in the yard? Have the owners done regular pest control? Are there any issues with the yard or garden? Open houses vary, but there are some common etiquette rules to follow. Don't forget to sign in; leave your name only if you prefer not to include your contact information. Be sure to greet the listing agent. Let the agent know you have questions, but don't keep them from being able to interact with other visitors. Discuss, don't dominate. Expect to answer a few questions about yourself, such as "How long have you been looking?" A good listing agent will be trying to determine who's a serious buyer and who's there for the free mints.